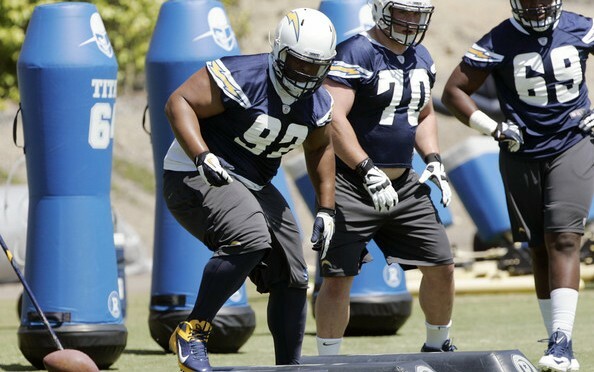 SAN DIEGO – As a fifth-round pick in this year’s draft by the San Diego Chargers, Ryan Carrethers expected to compete for a starting job at defensive tackle. the depth chart during training camp. But with football, players always remain a few plays away from ascending up the depth chart, and that’s what happened with Carrethers. Lissemore did not play last week at San Francisco because of a balky ankle injured against Seattle two weeks ago. And Lissemore's replacement, Geathers, suffered a season-ending knee injury during the opening quarter of the San Francisco game. Thrust into the starting lineup against one of the best offensive lines in the NFL, Carrethers held his own against the 49ers, finishing with a tackle in 25 snaps at San Francisco. Carrethers is one of seven healthy defensive linemen for the Chargers, and currently penciled in as the team’s starting defensive tackle until Lissemore is healthy. At 6-1 and 333-pounds with a 700-pound squat to his credit, Carrethers is more than strong enough to play effectively inside. However, Chargers defensive coordinator John Pagano has said that it’s the mental side of the game -- getting the call, getting lined on the field correctly every play and consistently playing with the right pad level -- that Carrethers needs to master in order to improve his game. “He’s still a rookie,” Pagano said. “He’s still going to do rookie things, and he’s learning. It was an eye-opener to him just being out there with the 1s, and going against a really good offensive line that San Francisco has. Once Carrethers understands and feels comfortable in Pagano’s defensive scheme, he’ll start to resemble the player that finished with a career-high 93 tackles at Arkansas State last season.